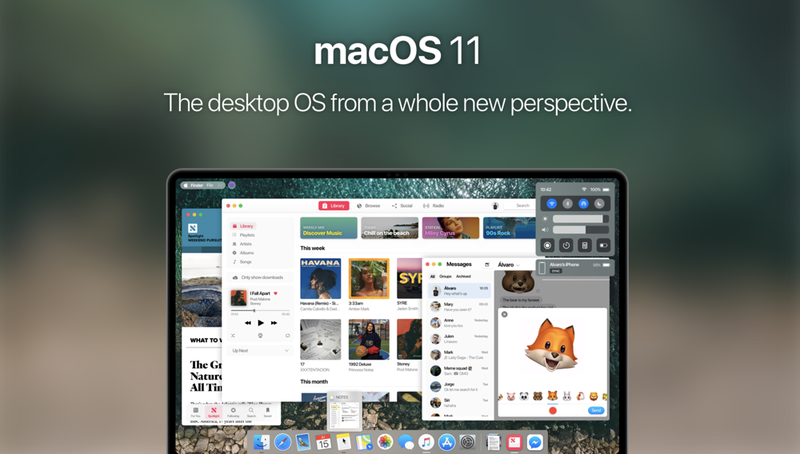 If you’ve been dreaming about a macOS 11 revamp, then this concept will definitely appease you in many ways. Though iOS has seen some great changes over the year, but the same cannot be said for macOS. Sure, it went from OS X to macOS, even the UI was flattened out, but the core elements are the same. One designer, Alvaro Pabesio, obviously thought that macOS was destined for a major redesign and he went to create what Apple might release some time down the line. Dubbed as a ‘new chapter for macOS,’ the concept imagines a revamped user-interface for the desktop that takes a lot of elements from the iPad, and more specifically, the iPhone X. No, it does not include the notch or anything, but features a lot of stuff from Apple’s smartphone, such as Animoji as well as Portrait mode. Starting things off is that brand new user-interface that feels like home if you’ve ever used an iPhone or iPad. There are universal apps as well, something that is rumored to arrive on the Mac with the next iteration of macOS. If you think that’s not enough, then you will be surprised to learn that this macOS 11 concept imagines the OS to feature its very own Control Center along with a beautiful dark theme. Rather than us do the talking, have a look at the macOS 11 concept yourself and check out what the future has for us. There is a ton of new stuff in the concept, if you’re asking us. But the problem is: there’s way too much new stuff in the macOS 11 concept. Which means that we might not see something similar to it for a long, long time. If Apple’s going to revamp its desktop, it’s probably going to do it very slowly. I’ll go as far as saying that you shouldn’t hold your breath for it just yet. But do we want this in our lives? Definitely yes!